Your illo reminds me of this December's blockbuster!!! Can't wait to see another Peter Jackson film. See you at the movies! Who couldn't love a face like that. KK is tres-metropolitan! A real social climber. Great illustration - yours are always fun. beautiful as always! love that colors! Love that KK is resting his elbow on the building, really makes it fun, and I like the play of blue buildings against the orange sky. Ah, so great! I love the random scattering of windows against the dark blue buildings and the wee woman! so cute! It looks like the lady is giving instructions to large gorilla about future development within the Metropolitan environment. Perhaps she is a politian and has plans for over-development, has an obvious advantage over the protestors and pays the gorilla with bribes from the wealthy developers who can afford to purchase whole banana farms for him? what fun! they're certainly having an intent discussion, aren't they?! i'd say that she's his agent, chatting about royalty negotiations! love the blues versus the oranges, strong colour! Thanks, all! I didn't want to spend too much time on this one - just do something fairly immediate. 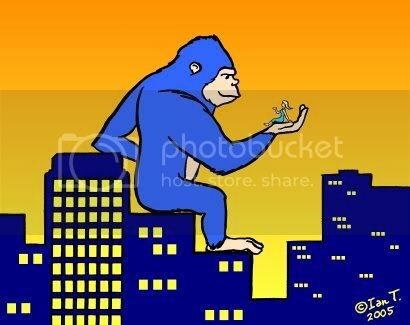 You all seem to have understood the mood I was trying to capture, which was a casual Metropolitan giant gorilla and lady friend, relaxing downtown - maybe not King Kong himself, perhaps his second-cousin or something :). I wanted them to look like they're having an animated conversation. Initially, I thought about the girl holding a martini, but to show she's talking she had to be more animated. In the original sketch, the figure I drew sitting on the gorilla's hand didn't look good, so I drew another in fine pen separately on the same sheet and pasted her across. Bertha, getting the right balance of windows and not overdoing it, was tricky! Aravis, I've always been bemused by the way Fay Wray, the actor, has had her name effectively become the name of the character from King Kong. Does anyone remember the character's name? It's a bit like the opening song to The Rocky Horror Picture Show :). Yeah- the cute girls always go for the "bad boys"
Ah, I really like this. King Kong is an all time favorite character.